"Bell dumplings" was founded in 1893, bell founders lishaobai. Cook later called Zhong Fansen, because at the beginning of the opening locations in Litchi alley in Chengdu. It is also called "litchi Lane Boiled dumplings". The shop is the most famous varieties and two kinds of Boiled dumplings Red oil Boiled dumplings soup. Boiled dumplings taste delicious, Red oil spicy, sweet and salty, together with the store special salt and pepper crisp Kui, really do not have a taste. Marked dumpling by hand leather and stuffing material strictly, the production of fine, coupled with seasoning homemade distinctive red salted soy sauce, seasoning properly by eaters alike. Boiled dumplings soup, taste delicious, light but not thin, delicate entrance of slag, the best pasta products in. "1920s year clock Boiled dumplings" for Chengdu, Chengdu became famous local snacks. In 1992, the "bell dumplings" by Chengdu municipal government named as the "Chengdu snack", 1995, was awarded the "China time honored brand", the Ministry of internal trade, and in 1999 won the "Chinese famous snacks," the title. Breaking the southerners did not like pasta routine, Chengdu people of dumplings, steamed buns, noodles are very popular, from bell dumplings, Han steamed stuffed bun, Dan Dan noodles are Chengdu snack can be seen. People generally think, (chaoshou wonton) is a dumpling evolved. In fact, is the first after the wonton dumplings. "Play" Shi Yan fan Lu said, "Lu pistachio''''''''s wonton is in, for the village''''''''s, to long". Later, people made the wonton crescent shaped, became dumplings. According to the historical data, the Han have wonton, real dumplings began in the Sui Dynasty, flourished in the Tang Dynasty, dating back about one thousand hundred years. Tang Dynasty, dumplings have been reached in the remote areas. Archaeologists in a Tang Dynasty tombs unearthed in the Tang Dynasty in the wooden bowl, found the full of dumplings. If the wonton dumplings mother, that she did a dumpling much a feminine beauty, the form of chic rejoice, the color white rosy the road smell mellow foam. Dumplings are obviously added a lot of masculinity. Especially strong North dumpling skin hunger. The dumplings in the south, especially in the Chengdu dumplings, although different from Chao Shou Yin and Yang, but compared with the northern dumplings, but a little more witty focuses more on modification of their own. The stuffing is leek Boiled dumplings, Chengdu Boiled dumplings is the meat stuffing. Zhong Shuijiao is the outstanding representative of Sichuan Chengdu and Boiled dumplings. 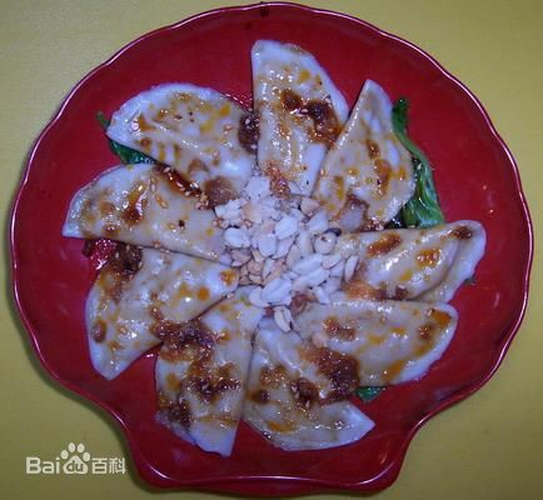 The bell Boiled dumplings in 1990 by the Chengdu Municipal People''''''''s Government awarded the "Chengdu City snack" title. The clock in the shop on the Boiled dumplings in 2013 admiral Street No. 7 West Street No. 146, ERON has branches.